On advanced manufacturing, work ethic, and the joy of discovery! My name is James Nowak. I am from Cheshire, Massachusetts. I am a second year graduate student in Mechanical Engineering, working with Prof. Johnson Samuel. I received my BS and MS degrees in Mechanical Engineering from RPI in 2016. Rensselaer is a top-tier engineering university, and it is close to my hometown! I have always been interested in the field of advanced manufacturing and Rensselaer offers world-class facilities and faculty in this research area that very few other schools have. 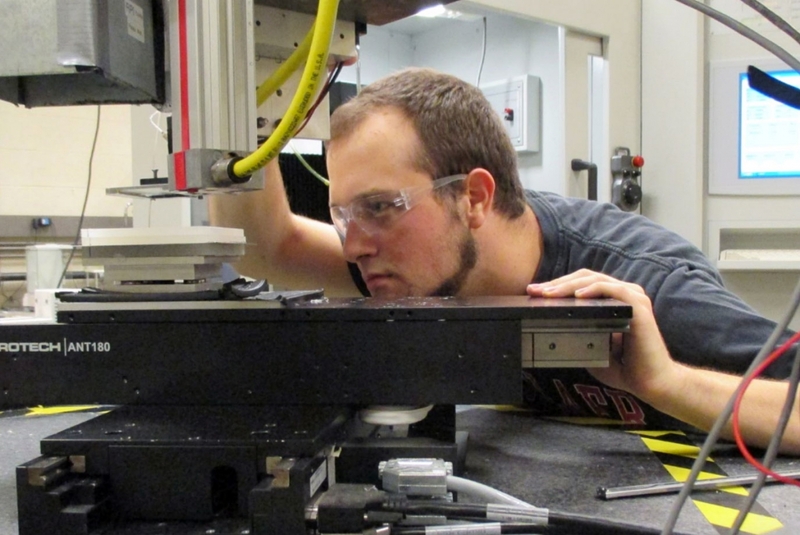 Specifically, the Manufacturing Innovation Learning Lab (MILL) provides a hands-on class experience that simulates working in a real-world advanced manufacturing facility. I also enjoy the scenery of the campus, and the centralized location of the campus within the capital region of upstate NY. I have enjoyed my time at Rensselaer, both as an undergraduate student and graduate student. Rensselaer has provided countless opportunities for me to develop my technical, professional, and leadership skills both as an undergraduate and graduate student. Rensselaer provides all the opportunities of a large university, but the smaller student population allows me to get to know many of the fellow students and faculty in my major, and be an active member in the campus community. My research focus is bio-manufacturing processes, specifically the development of bio-printing Growing up, I have always been around manufacturing facilities and I gravitated towards this area of engineering. Bio-manufacturing looks at the interface between these processes and the biomedical domain. Engineers have been able to manufacture all of the engineering materials we see around us, so the next challenge is being able to manufacture living tissue and eventually organs. Doing research feels like running a small start-up company, where a few people (you, your advisor, other colleagues/assistants) try to manage a large set of deliverables! You get to be your own manager, drive the project and your team in the direction you see fit, make discoveries, write about them, and then present them at conferences. When I am doing research, I never count the hours I spend working on a problem or doing an experiment. To me, the challenges you face in research are a fun puzzle, and no one knows the solution, so it is up to you to work hard and exhaust all the possibilities to solve it. And when you find that solution, there is no better feeling. Personally, what drives me to excel is the work ethic my parents taught me growing up in a small, blue-collar town. My parents and grandparents worked hard throughout their lives to provide a better livelihood for their children. Winning the fellowship was the greatest honor I have received to this point in my life. Growing up in a small rural town, I would have never imagined winning such a prestigious award. This award provided a validation of all the work I have done to this point in my life, as well as pushes me to continue to work hard in order to obtain my doctorate and become a positive change agent in the world. To be honest, I am not sure. I enjoy mentoring the undergraduate students who work in my lab as well as the campus lifestyle, so I am leaning towards pursuing a career in academia, but that may all change based on what the future holds. I enjoy watching and rooting for New England sports teams (Boston Red Sox, New England Patriots, Boston Celtics, Boston Bruins). During the summer months, when I am not researching, I try to get on the golf course and work on my game or attend baseball games either locally, or in Boston or New York. What is your favorite thing to do in Troy? In Troy, I really enjoy the old, industrial style architecture located in the downtown area and on the Riverfront. There are also plenty of festivals and activities that go on downtown during the summer months where you can go out and get to know the community and have fun. I especially enjoy heading up to Saratoga to watch the race horses during their season. Favorite Book: Anything that is a biography or autobiography. I enjoy reading about how others have made it in their careers, so I can learn from them.